This large family includes around 180 genera and 2,500 species of mostly herbs and shrubby plants, expanded by recent incorporation of the Family Chenopodiaceae. Thickened stem nodes are characteristic of many species as is the presence of reddish Betalain pigments, characteristic of the Order Caryophyllales. Leaves are generally alternate or sometimes opposite, but may be reduced to vestigial scales. C-4 metabolism is present in about a third of the species, allowing more efficient use of water in arid or salty habitats. 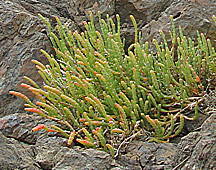 Many species are halophytes. A small number of species are succulent. 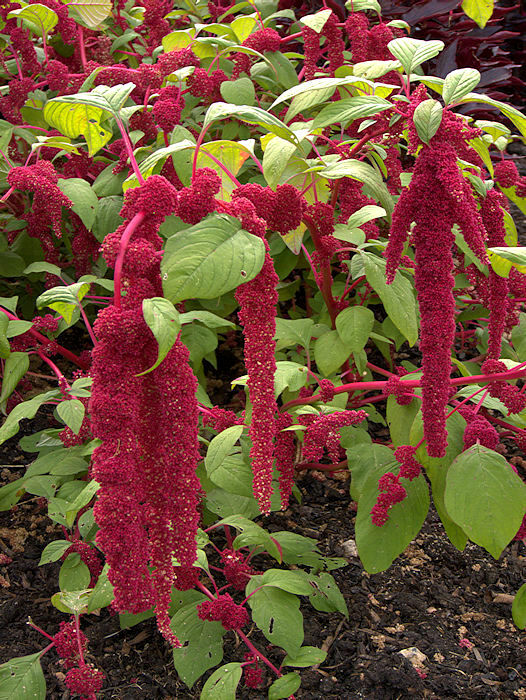 The genus Amaranthus from which the Family takes its name, contains about 60 species of herbs including ornamental plants (A. caudatus, A. hybridus, A. tricolor) whose brightly-coloured cymes of densely-packed flowers appear in late Summer and Autumn. 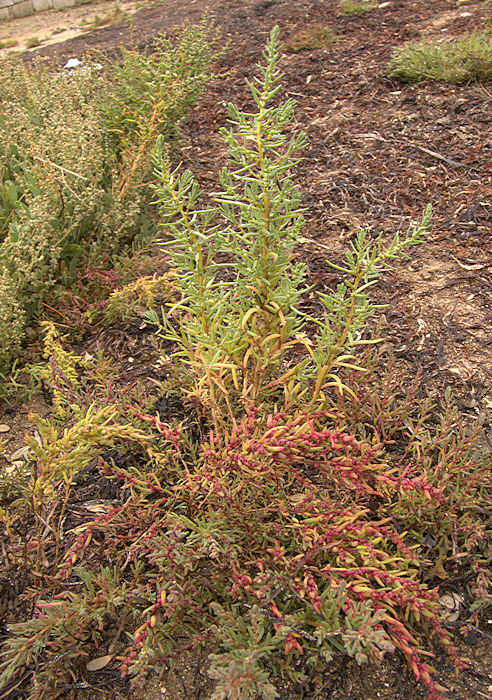 Some Amaranthus are weedy plants "pigweeds" that are a considerable nuisance to farmers. Cultivated Amaranth seed is harvested in Asia and in the Americas, where it was cultivated on a large scale by the Aztecs as huauhtli. The leaves of some species are also eaten (Chinese spinach). The genus Beta includes Beta vulgaris, selected forms of which are important agricultural crops including beetroot and sugar beet. 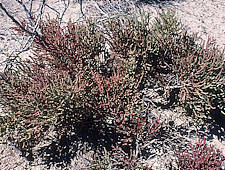 The genus includes three species of perennial halophyte shrubs from the Americas. The stems have a jointed appearance. Allenrolfea occidentalis is native to the South-Western USA and two species are from Argentina. 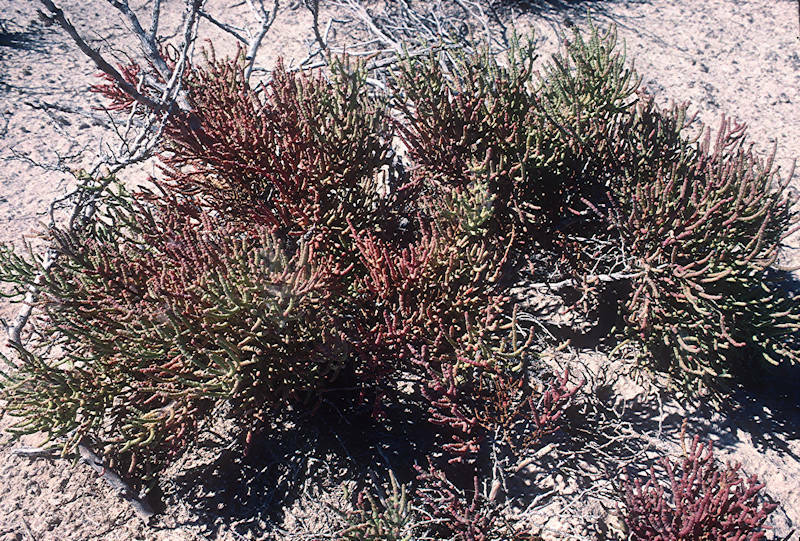 Native to alkaline soils and salt flats. 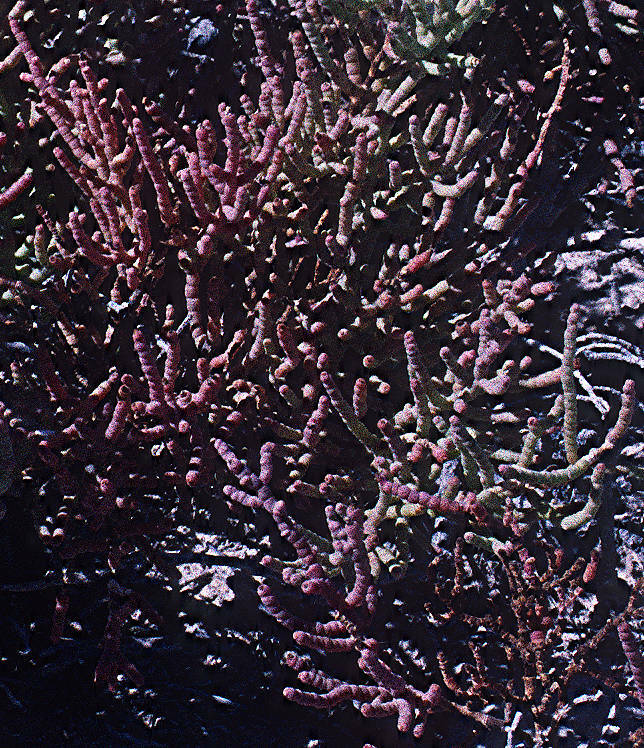 This upright to sprawling salt-tolerant succulent bush grows 3 - 4 ft tall. 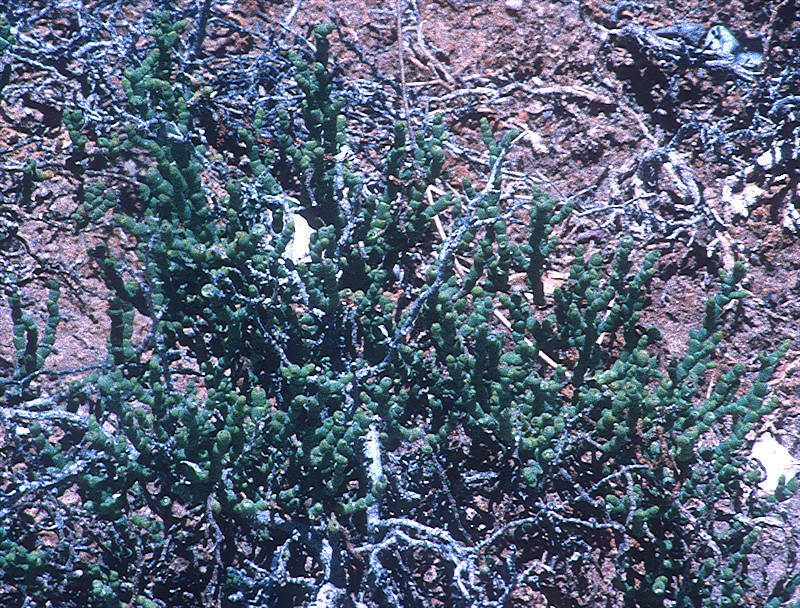 The frequently-branching greenish stems are composed from many jointed triangular to rounded sections and redden in the sun, eventually becoming woody. The tiny triangular leaves are vestigial and easily overlooked as are the tiny spikes of greenish-yellow flowers. 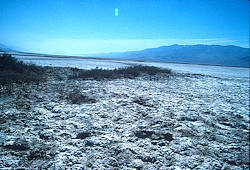 Native to alkaline salt flats and other alkaline sandy soils in Northern America. 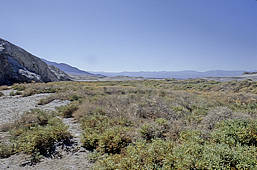 Where found these shrubs may comprise the majority of the vegetation as little else grows in such a harsh environment. The seeds have been used as food. Crushed stems leave a brown stain, hence the common name. Left, middle left: Allenrolfea occidentalis on salt flats in front of the Guadalupe Mountains, Tx. 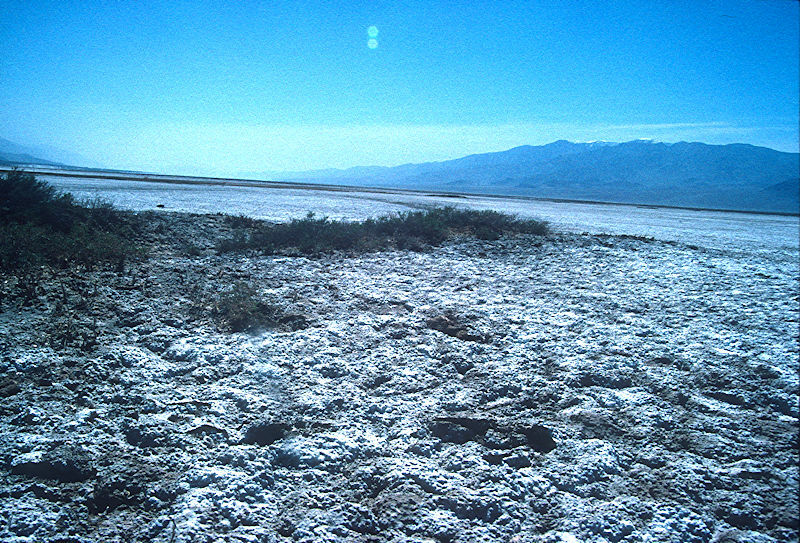 Middle right, right: Death Valley on salt flats near the Harmony Borax works. The genus Beta includes several low-growing annual and perennial herbs with fleshy, thickened roots and alternate leaves. The inflorescence is a long cyme of tiny greenish, white, yellowish to red flowers. The type species Beta vulgaris includes several cultivated beets that are important agricultural crops and wild salt-tolerant plants that grow on coastal margins. The characteristic purple-red colour of beetroot is provided by Betalain pigments that are named after the Red Beet. 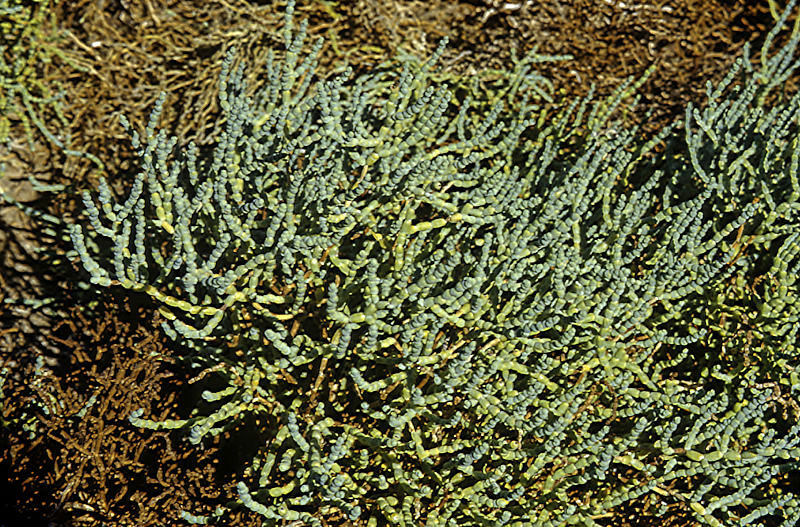 A low-growing salt-tolerant perennial branching herb whose slightly succulent dark glossy green ovate to triangular leaves are marked by a strong mid-rib. 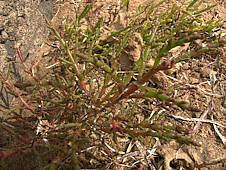 The plant is supported by a thickened succulent tap root. Spikes of tiny yellowish green hermaphrodite flowers are produced during the Summer and pollinated by the wind. Widespread along coastal margins of Europe, North Africa and Southern Asia. This plant is the wild ancestor of all cultivated beets. The leaves may be eaten raw or cooked and there is a long history of the plant and seeds being used in herbal medicine. 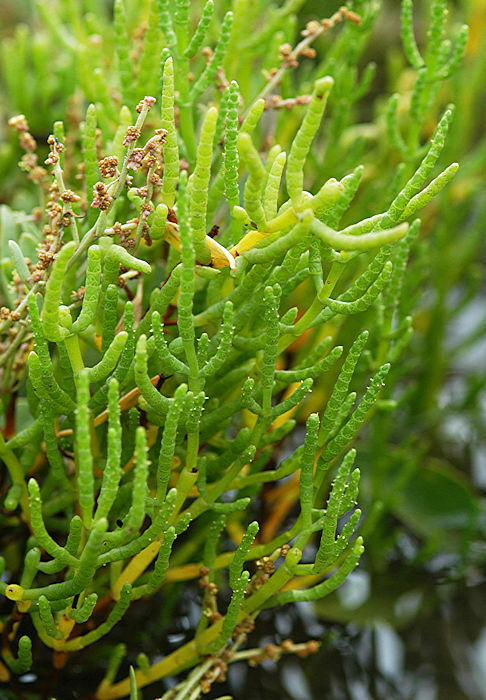 These succulent, halophyte (salt tolerant) plants are found growing on salt marshes and beaches throughout the world except for Antarctica. 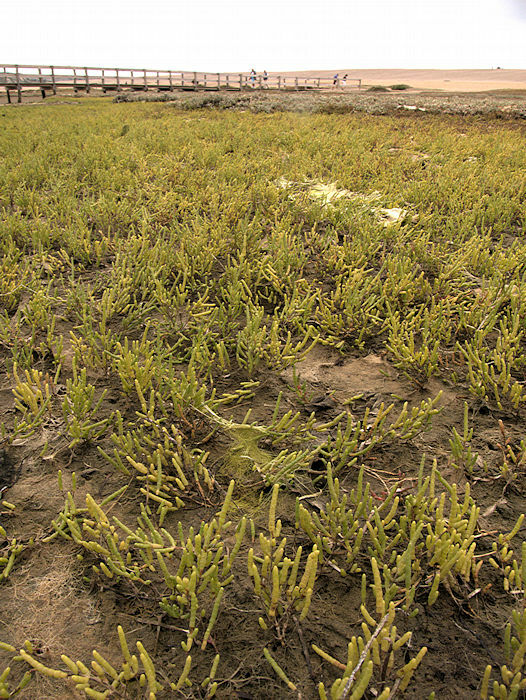 Salicornia vegetation stabilise mud flats and by enhancing the accumulation of mud enable a salt marsh to become higher and drier. They are small succulent annual herbs with a jointed main stem and few lateral branches. 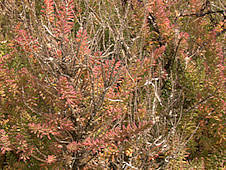 The green stems may colour up red in Autumn or when stressed. The vestigial leaves are small and scale-like. Differences in the layout of these differentiates many of the species. 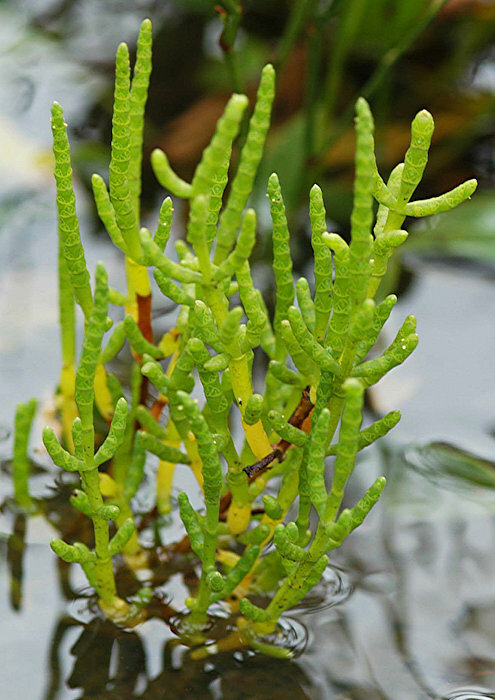 Salicornia species use the C4 carbon fixation pathway. 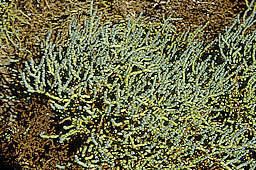 Species of Salicornia with perennial stems were transferred to Sarcocornia in 1977 leaving around 60 rather similar species in the genus Salicornia. 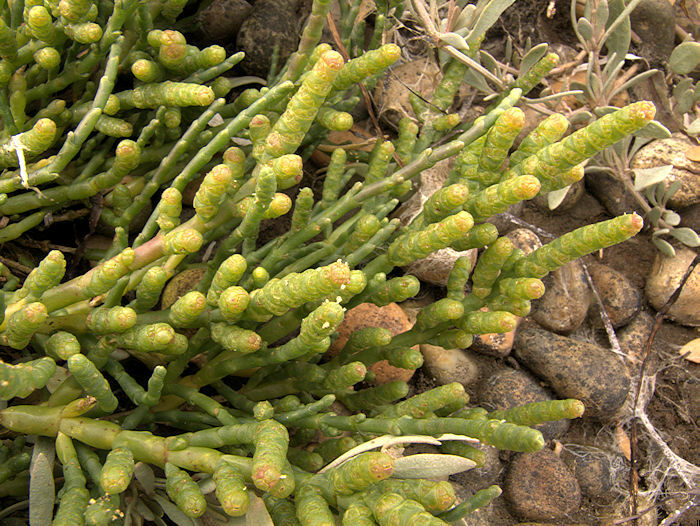 Salicornia europea (Marsh Samphire) can be eaten either as a salad or lightly steamed, as can the American species Salicornia virginica. The stems are an annual growth in late Spring from a perennial root and die back in the Autumn. Glassworts have been used as a source of soda ash for glass making and soap manufacture. 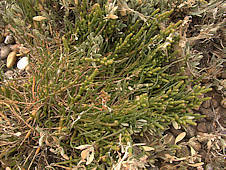 Salicornia bigelovii produces seeds with up to 30 percent unsaturated oil which contains toxic saponins but can be converted into bio-diesel fuel. 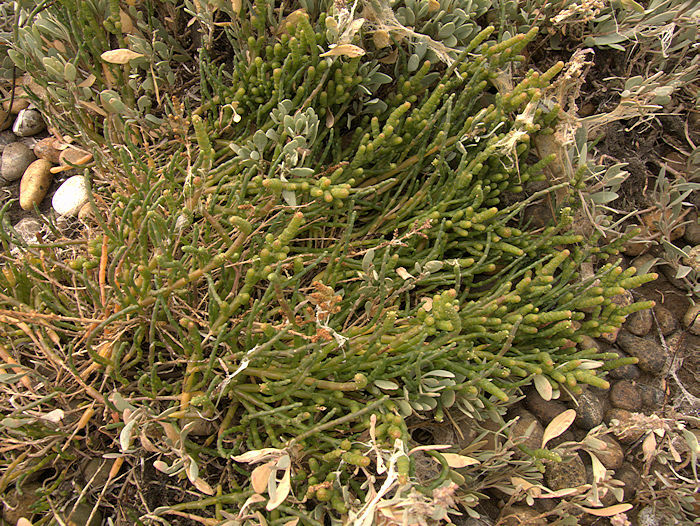 As it can be grown in salty water or ground this plant is a useful crop for land otherwise unsuitable for agriculture. 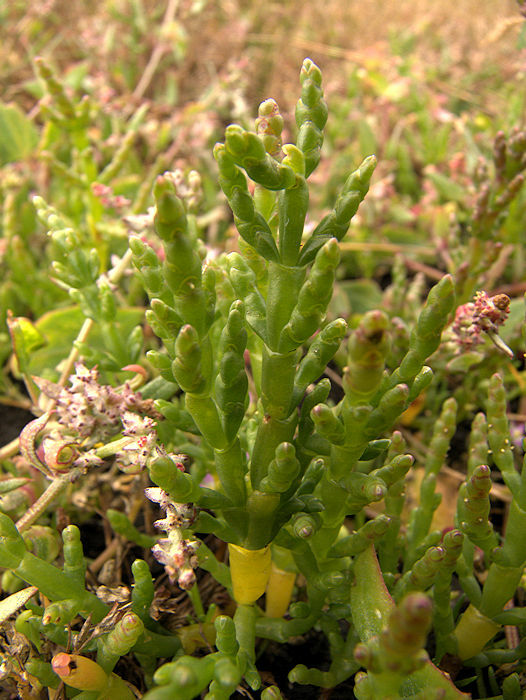 Several other unrelated plants are known as "Samphire" including halophyte succulent species in the Family Apiaceae Crithmum maritimum (Rock Samphire) and in the Family Asteraceae Limbarda crithmoides (Golden Samphire). 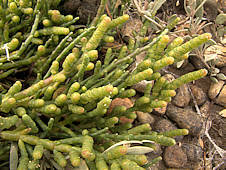 The common name "Samphire" is a corruption of French "Saint Pierre" (Saint Peter), named for the patron saint of fishermen because these edible plants grow on salty rocks along the European coastal margins. This succulent plant is an annual, growing up to 1 ft tall. Tiny hermaphrodite flowers are produced in August and are wind pollinated. 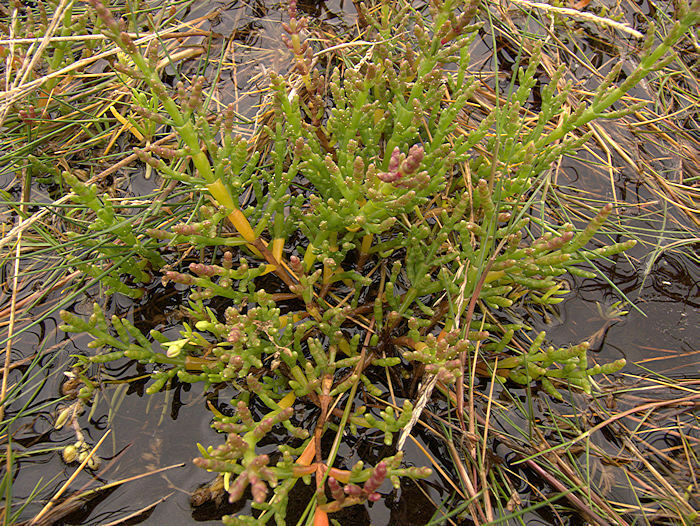 Native to the lower parts of salt-marshes, sometimes growing below high water level. This succulent plant is an annual, growing up to 1 ft tall. Tiny hermaphrodite flowers are produced in August and are wind pollinated. 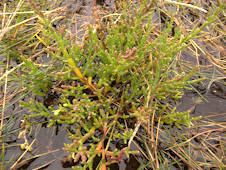 Native to muddy and sandy salt-marshes. 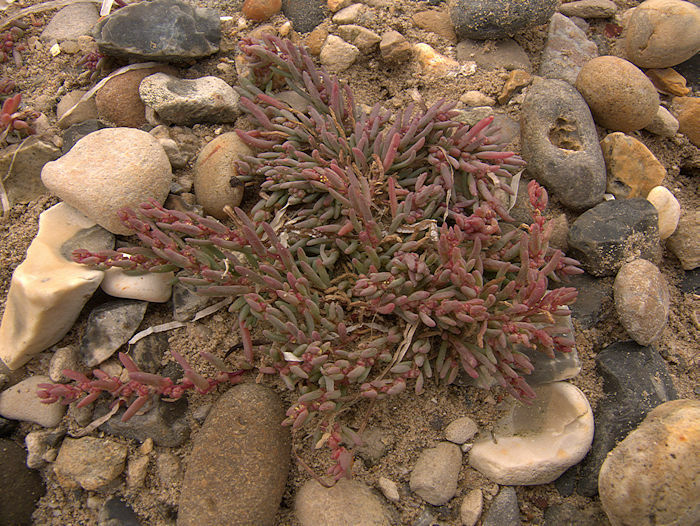 Left: Salicornia europea on the Chesil Beach, Dorset, England. This annual succulent plant grows up to 1 ft tall, but usually much less. Tiny flowers are produced in August. 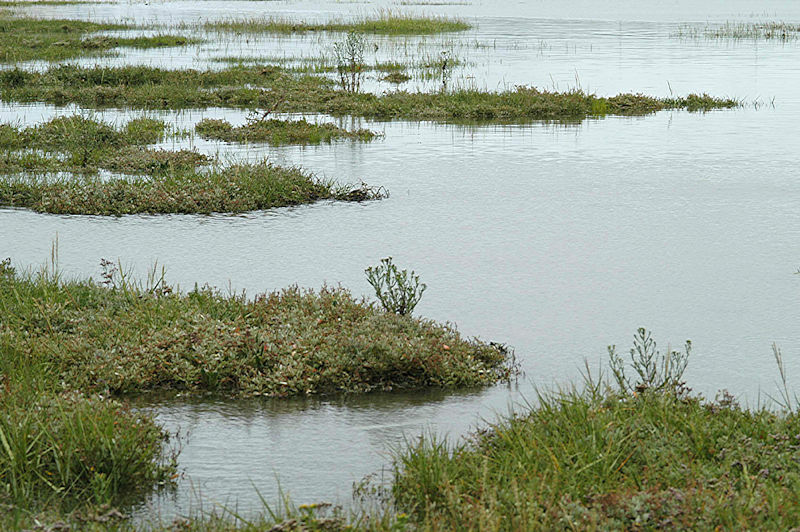 Native to upper levels of muddy and sandy salt-marshes, usually above water. 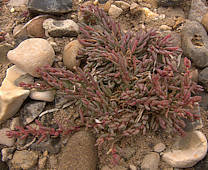 Left: Salicornia ramosissima on the Chesil Beach, Dorset, England. 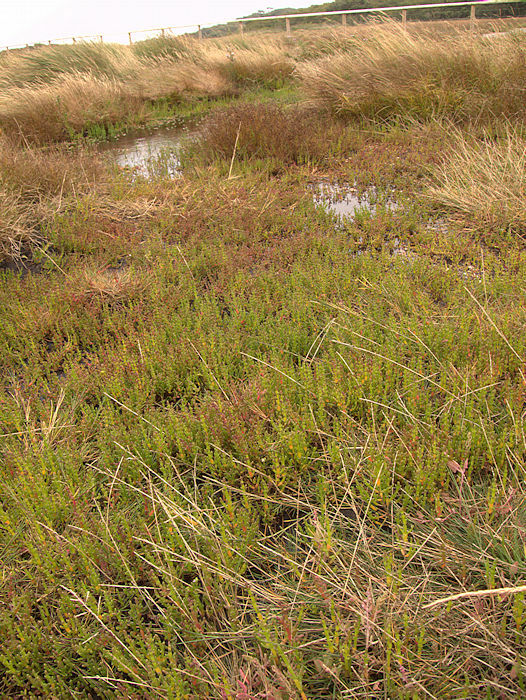 Left: Salicornia ramosissima in the salt-marsh behind Hengistbury Head, Dorset, England. The water in which the plant was growing was well above that of the tidal esturary and probably only slightly salty. 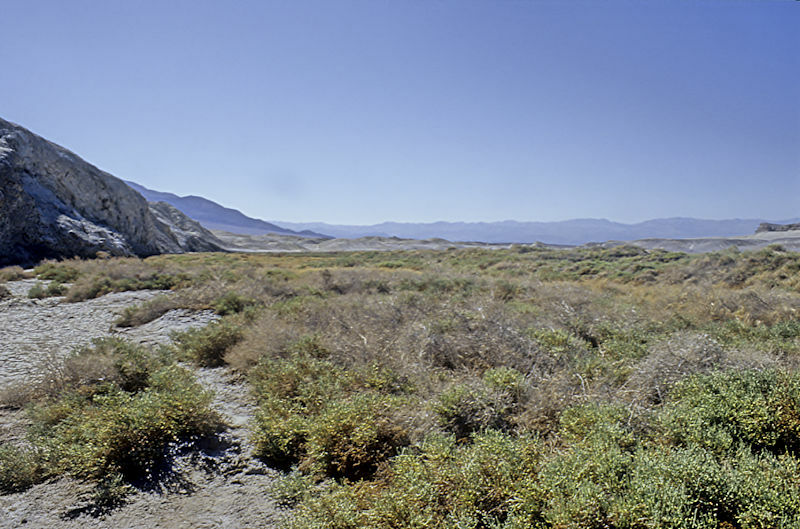 Left: Salicornia rubra at Salt Creek, Death Valley, California USA. This annual succulent plant is one of the most salt tolerant species and on the alkaline, salty soils of Death Valley it needs to be. 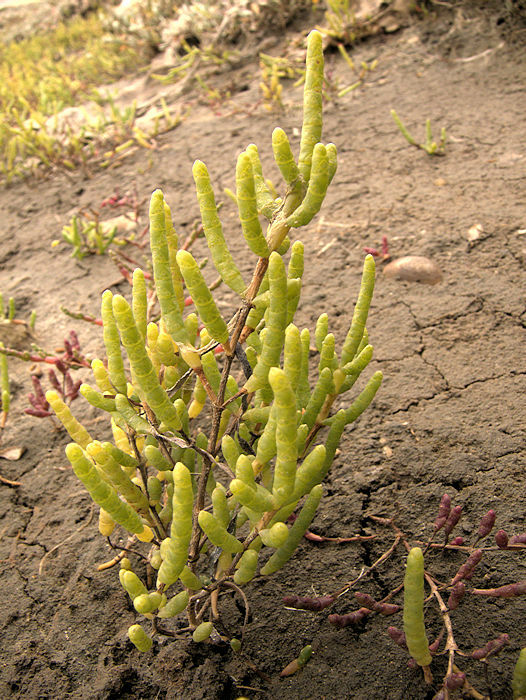 Fifteen species of Sarcocornia were separated from Salicornia in 1977 on the basis of their perennial stems. These succulent, halophyte (salt tolerant) plants are found growing on salt marshes, alkaline salt flats and beaches throughout the world. They are small succulent herbs and low succulent shrubs with perennial jointed main stems and few lateral branches. The green stems may colour up red in Autumn or when stressed and become woody with age. The vestigial leaves are small and scale-like. 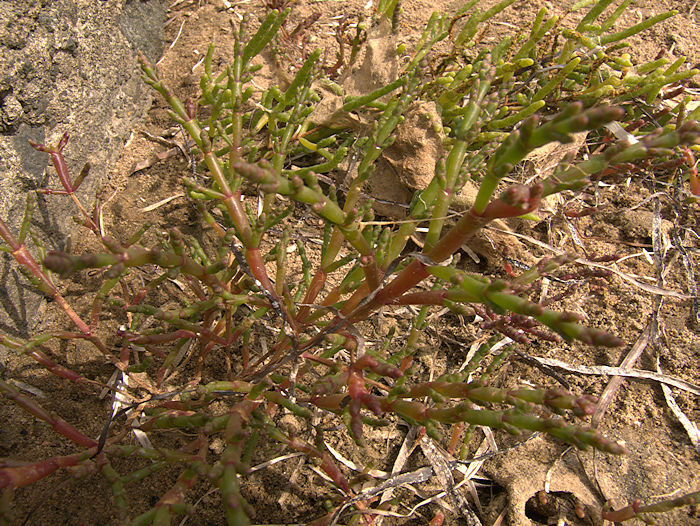 This species forms a mat of procumbent stems, spreading by way of slender stoloniferous stems. Widely distributed on muddy and sandy salt-marshes and their margins usually above the high tide mark. 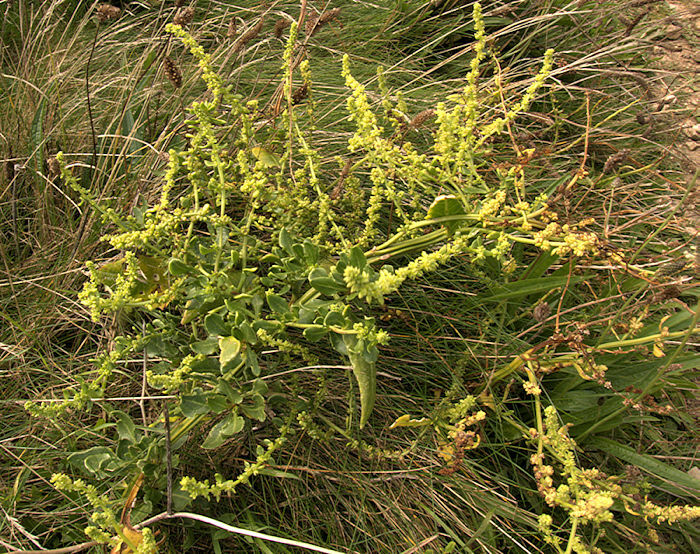 Left: Sarcocornia perennis on the Chesil Beach, Dorset, England showing both mature and stoloniferous stems. 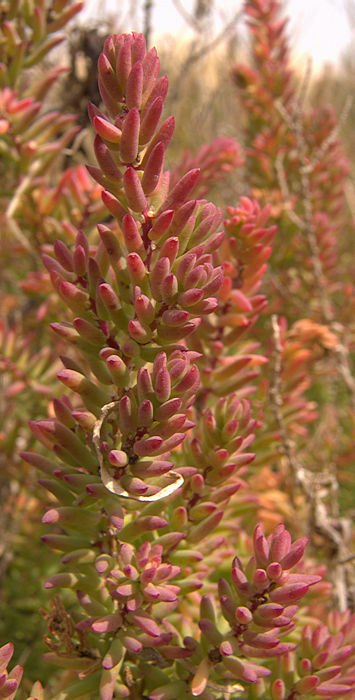 The perennial jointed stems of this succulent plant grow up to 18 ins tall and colour up red when stressed. The stems have a fibrous core and older stems become woody. Native to New Zealand and Australia. 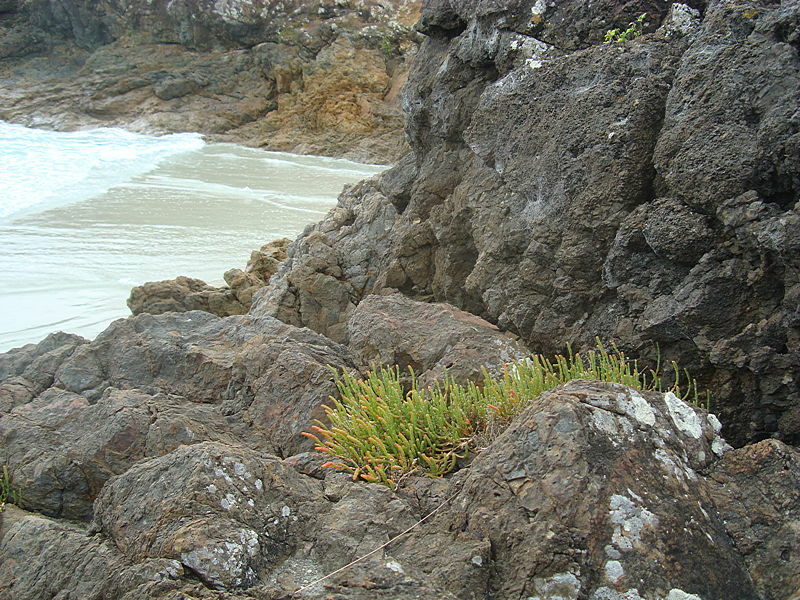 Left: Sarcocornia quinqueflora growing on rocks at Puwheke Bay on the Karikari peninsula, New Zealand. Photos: F. Caviggia 2013. 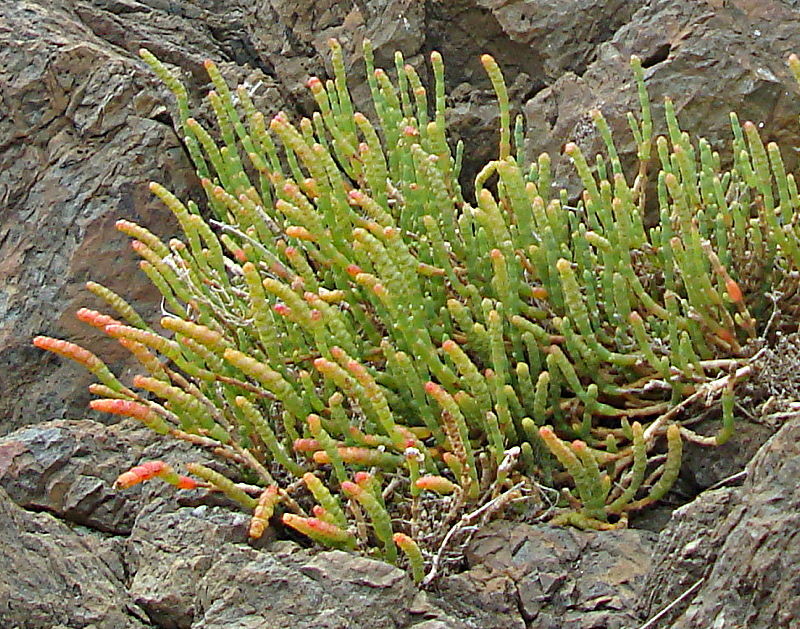 The genus Suaeda includes 110 species of salt and alkali-tolerant succulent plants found on coastal margins, salt marshes and salt flats. 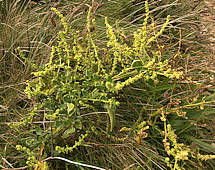 These plants, especially Suaeda vera (Shrubby Sea-Blite) were burned as a source of soda-ash, used in the manufacture of soap and glass. 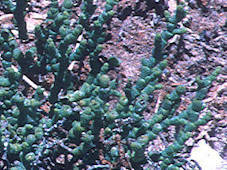 Salt extracted from the leaves turns black as it dries, hence the genus name. A salt-tolerant succulent plant with fleshy leaves, growing up to 1 ft in height. 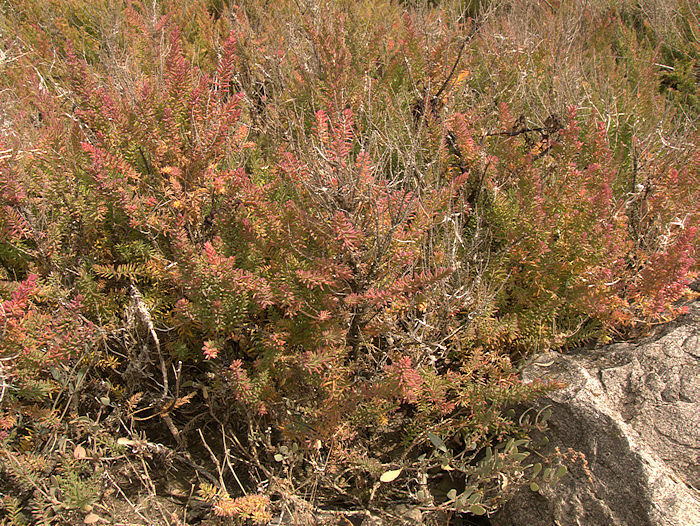 The foliage turns red when over-saturated with salt. Small hermaphrodite greenish flowers are produced in late Summer and are pollinated by the wind. Widely distributed on coastal margins around the world. 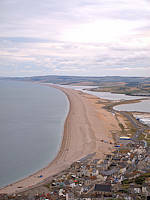 Seen here at the Portland end of the Chesil Beach, Dorset, England. The succulent leaves are edible with a salty flavour and can be pickled in vinegar. This evergreen shrubby succulent plant has rounded succulent leaves along requently-branching woody stems, with the leaves tending to colour up bronze or red. The small greenish flowers with yellow stamens and reddish stigma are hermaphrodite. Native to Mediterranean coasts, Atlantic coasts of Europe, the Madeira Islands, and South-Eastern coasts of England. Usually found adjacent to salt-marshes, especially where these meet shingle banks. 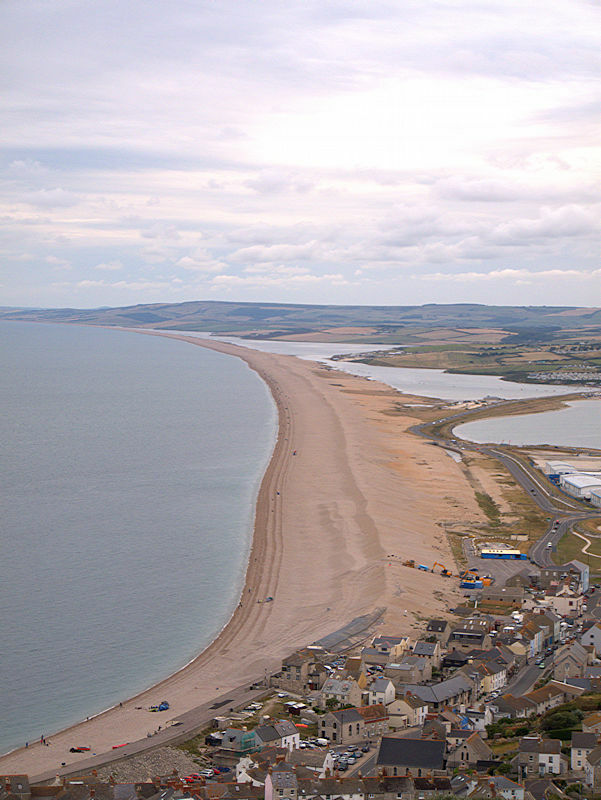 Seen here at the Portland end of the Chesil Beach, Dorset, England.